Dr. Sebastian Weydner-Volkmann (née Sebastian Volkmann) is a post-doctoral researcher in Philosophy and Applied Ethics. He works at the University of Freiburg’s Centre for Security and Society and Husserl Archive, where he has been part of the research staff since Mai 2012. For two interim periods, he took the position as Administrative Manager of the Centre for Security and Society. Currently, he leads the Freiburg research contribution to the EU H2020 project TRESSPASS. Furthermore, he is part of the research and teaching staff at Freiburg’s Department of Philosophy and is involved in establishing the tri-national graduate academy SERIOR. Since 1. 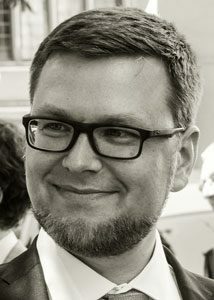 Mai 2012, Dr. Sebastian Weydner-Volkmann (née Sebastian Volkmann) has been working at the University of Freiburg’s Husserl Archive and Centre for Security and Society. Since October 2017, he is a member of the regular teaching and research staff at the Department of Philosophy. Dr. Weydner-Volkmann was involved in a range of applied ethical research projects in the field of civil security provision. In the EU FP7 project SURVEILLE, he conducted research on the ethical and perceptive dimensions of surveillance technology (Mai-August 2012). From September 2012 to August 2017, he developed a typology and ethical evaluation framework for airport checkpoints as part of the EU FP7 project XP-DITE. One of the major goals of this research was to provide guidance on ethical and societal aspects in the design process of airport checkpoints, especially on the protection of fundamental rights and privacy. From October 2015 to September 2017, he has accompanied the development of an innovative, privacy respecting solution for THz body scanners as part of the EU FP7 project TeraSCREEN. Since June 2018, Dr. Weydner-Volkmann leads Freiburg’s research contribution the EU H2020 project TRESSPASS. Dr. Sebastian Weydner-Volkmann has completed his PhD at the University of Freiburg under the supervision of Prof. Dr. Hans-Helmuth Gander. His thesis has been published under the title “Moralische Landkarten der Sicherheit. Ein Framework zur hermeneutisch-ethischen Bewertung von Fluggastkontrollen im Anschluss an John Dewey” (“Moral Maps of Security Provision. A Hermeneutical Framework for the Ethical Evaluation of Airport Passenger Screening Following John Dewey”). For his thesis, Dr. Weydner-Volkmann was awarded the Wetzstein Award for Philosophy 2017. For the interim period of December 2017 to May 2018, Dr. Sebastian Weydner-Volkmann took the position of Administrative Manager of the University of Freiburg’s Centre for Security and Society, a position he already had for an earlier interim period from November 2015 to March 2016. Furthermore, from April 2016 to Mai 2018, he was involved in establishing the tri-national graduate academy “Security – Risk – Orientation” (SERIOR). Dr. Sebastian Weydner-Volkmann has extensive experience in European research project management. He was responsible for the financial and administrative management of the Centre for Security and Society’s participation in the EU FP7 projects XP-DITE and TeraSCREEN. In both projects, he coordinated European partners as a work package leader for the ethics related research tasks. Since June 2018, he leads Freiburg’s research contributions to the EU H2020 project TRESSPASS. Sebastian Weydner-Volkmann finished his university degree (“Staatsexamen für Lehramt an Gymnasien”, state examination equivalent to M.A. degree) in 2011 with distinction. He majored in Philosophy and English Literature and Linguistics; additionally he majored in Political Science. His thesis has the title “Hannah Arendt und ‘der Diskurs’. Zum Verhältnis von Macht und Gewalt” (“Hannah Arendt and hegemonic discourses. On the relation of power and violence”). From 2007 onwards, Sebastian Weydner-Volkmann was awarded a scholarship from the German National Academic Foundation for outstanding academic performance. Before working as a researcher at the Husserl Archive and at the Centre for Security and Society, Sebastian Weydner-Volkmann worked as a graduate assistant in the research project “Universality and Acceptance Potential of Social Science Knowledge”. Furthermore, he worked as an IT assistant for the University of Freiburg’s Frankreich-Zentrum. As a university student, he worked as a student assistant for Prof. Dr. Jürgen Rüland, chair for International Politics. For several semesters, he held tutorial courses for introductory lectures and seminars at the Department for Political Science. In Philosophy, Sebastian Weydner-Volkmann taught a tutorial course for the lecture of Prof. Dr. Maarten J.F.M. Hoenen on “Theories of Proof” in the summer term 2009.